Option 1) A few days at home resting, relaxing, recharging the batteries on some much needed time off; or, Option 2) Working in a place you haven’t been before with a slight amount of trepidation about the destination. Summer for me has been incredibly busy period with days off and solid rest time at a minimum. However during this time of year it is key to be working hard, squirrel like in preparation for the leaner times of the touring year. The work / life balance is tricky to manage at the best of times, but during the summer this can be harder still with the desire to say yes to everything very strong. This particular occurrence happened eight days before the eventual gig. It started with an email about potential availability cover for a band which I have been associated with and worked for, numerous times over the last few years, and whose tour manager (TM) is good friend of mine; I checked my diary to see that the dates lined up. 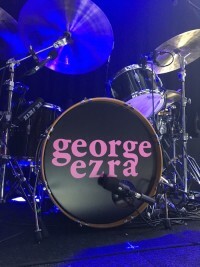 The travel and show days fitted in perfectly with a gap in the George Ezra calendar – this was time I had planned for myself to properly rest. Upon speaking to the Clean Bandit TM further, I decided that would make myself available for the show. The gig would take place in a country that I hadn’t yet visited and one that in my lifetime had suffered a difficult past – Beirut. 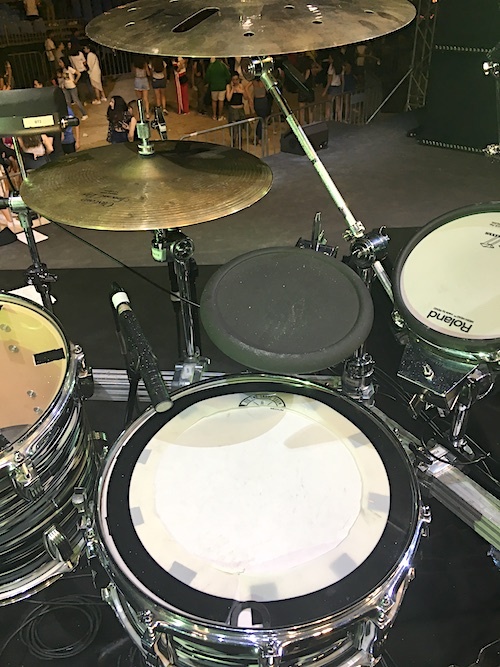 Visiting somewhere new during summer touring season is becoming a rare event due to the regularity of the established festivals, so to be offered the chance of a new experience was something that helped sway my decision. My preconceptions of the country were sculpted by my recollections of news reports during my younger days – Beirut and the surrounding area was dominant on our screens for mainly negative reasons. After agreeing to do the gig there was a flurry of activity relating to visa’s, passports, info about the show and the equipment we would be using for the gig. It was thought that this would be a fly gig with minimal hired backline – however trying to secure the intricate electronic focused equipment CB use was proving difficult. 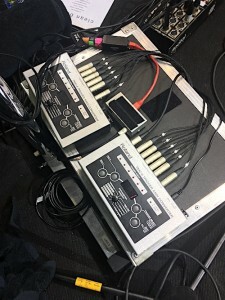 The decision was made to fly more of the bands touring backline, which, for me was a good thing because there would be more consistency for the performance. Visa secured, flights booked, handover sorted – I made my way to LHR for the five hour flight direct into Beirut. On this occasion due to the last minute nature of things I would be flying with one other person from the crew as the main touring party were booked on a flight with no availability left. I didn’t meet Jack (video and content) until we were in the cue for passport control in Beirut. We collected our bags and after a few luggage scans and some questions we met our driver for a long, seemingly vertical journey up the side of the mountain to the hotel. The world cup was on and the bars were teeming with life and people having a great time in the evening summer heat. We arrived at the hotel to discover there had been a power cut and we were being checking in by the light of a mobile phone! We were told that this was a regular occurrence – hopefully it wouldn’t affect the gig. We had arranged to meet the rest of the crew later but were told there flight was delayed by 2hrs so after our late dinner we decided to get some rest after a long day. Show Day – An early start and breakfast buffet reunions with old friends were the order of the day. In the local transport we headed back down the mountain we had driven up in the dark last night – the views were incredible, and the roads at times were treacherous. Getting to site we saw that the outdoor stage didn’t have a roof or any form of fixed shade and we were advised to try and stay well hydrated in the midday heat. The local crew erected huge umbrellas to offer some shade to both the equipment and us during setup. 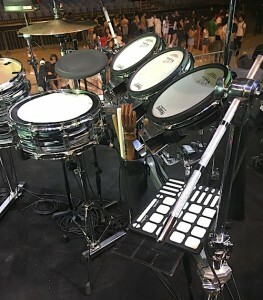 Around 80% of the equipment I would be using was flown from the UK – the only hired parts of the drum set up were 14×5” Ludwig Maple Snare, 12” and 13” Ludwig rack toms, four boom stands, and a concert (tall) snare stand. 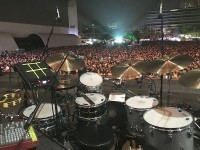 The rest of the setup is made up from a rack based system holding Roland pads and a small selection of Zildjian cymbals. The setup has evolved over the years that I have been involved with the band to its current form – a stand up kit, mainly electronic with all the sounds coming direct from Ableton via midi via the Roland TMC6 trigger to midi converters. 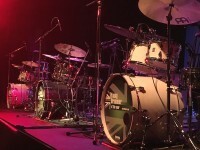 The current setup also has no bass drum parts played by Luke while he is in recovery from an operation on his ankle. 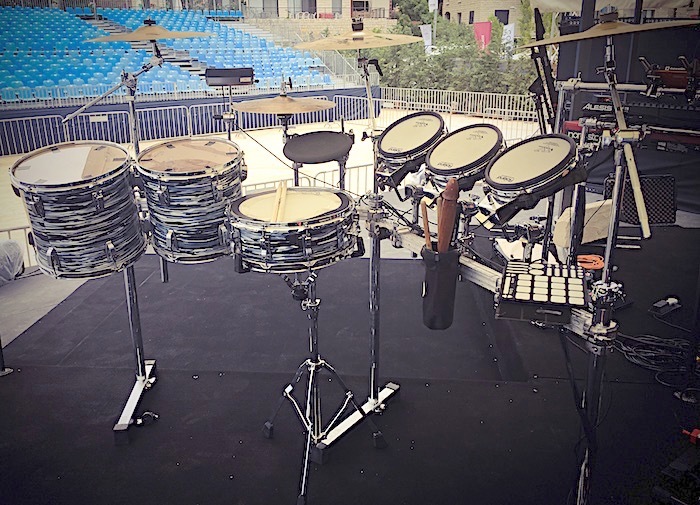 I worked on the tuning of the three acoustic drums to get them correct as per the tuning notes in the handover, wrestled with the hardware to try and make it work for the setup – this is sometimes the problem with hired gear and intricate, non ‘standard’ setups. Upon arrival Luke was happy with setup and sound of everything and the soundcheck ran smoothly for drums with only a few minor gremlins in guitar world which were quickly solved. We opted to stay on site as opposed to returning to the hotel due to the distance. The show was great – the crowd both young and old seemed to really enjoy the performance. The amount of people who wanted to meet the band after the show was the biggest I’ve seen for sometime. We packed down the gear in the cool evening air which was a welcome rest bite from the setup midday heat. Carefully packed and ready for the next gig we loaded the 20+ pieces of luggage into the transport.